A Senate Judiciary Committee seeks answers from Big Oil execs for rising oil prices on day that crude crossed $130 a barrel. 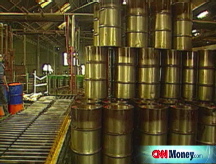 What is to blame for high oil prices? NEW YORK (CNNMoney.com) -- Amid increasing public outcry over record-shattering oil and gas prices, senators on Wednesday hauled industry executives in to testify about the recent runup. The Senate Judiciary Committee called the hearing to explore the skyrocketing price of oil, which jumped over $4 a barrel to a new record of over $133. The committee grilled executives from Exxon Mobil (XOM, Fortune 500), ConocoPhillips Co. (COP, Fortune 500), Shell Oil Co. (RDSA), Chevron (CVX, Fortune 500) and BP (BP) as to how their companies can in good conscience make so much money, while American drivers pay so much at the pump. "You have to sense what you're doing to us - we're on the precipice here, about to fall into recession," said Sen. Richard Durbin, D-Ill. "Does it trouble any one of you - the costs you're imposing on families, on small businesses, on truckers?" The executives said it did, and that they are doing all they can to bring new oil supplies to market, but that the fundamental reasons for the surge in oil prices are largely out of their control. "We cannot change the world market," said Robert Malone, chairman and president of BP America Inc. "Today's high prices are linked to the failure both here and abroad to increase supplies, renewables and conservation." Malone's remarks were echoed by John Hofmeister, president of Shell. "The fundamental laws of supply and demand are at work," said Hofmeister. The market is squeezed by exporting nations managing demand for their own interest and other nations subsidizing prices to encourage economic growth, he said. In addition, Hofmeister said access to resources in the United States has been limited for the past 30 years. "I agree, it's not a free market," he said. The executives pushed the idea that large parts of the U.S. that are currently closed to drilling - like sections of Alaska, the Rocky Mountains and the continental shelf - should be opened. "The place to start the free market is in our own country," said one executive. [The drilling ban] sets the stage for OPEC to do what we are doing in our own country, and that is effectively limiting supplies." John Lowe, executive vice president of ConocoPhillips, said Congress should enact a balanced energy policy. In addition to lifting the drilling ban, such a policy could include measures to encourage alternative energy sources, remove the ethanol tariff, promote energy conservation, cut regulations around refining. "We must work together to find a real solution," said Lowe. "U.S. oil companies should be viewed not as scapegoats, but as assets." The executives also named several things that Congress should not do, first among them being a hike in taxes or an undoing of the mergers of the late 1990s. "Americans need companies that can effectively compete for access to new resources," said Peter Robertson, vice chairman of Chevron. "Punitive measures that weakened us in the face of international competition are the wrong measures." The executives also frowned on a recently passed House bill giving the Justice Department the power to sue OPEC, saying it would have little effect in boosting production. The testimony was colored by a few outbursts of protest from members of the public. Before the hearing even began, a heckler in the crowd shouted: "Stop ripping off the American public - bring these oil prices down." The panel took issue with the amount of money oil firms are investing in finding oil, and investing in renewables. "You know how much cash you have on hand compared to capital investment," said Durbin. "They are begging us for more refineries, for more exploration, when their refineries are only operating at 85 percent." Chevron's Robertson said the issue wasn't really one of refining, and more just the price of crude. We are investing all we can [in finding new oil] given the limitations of access and our own human capacity," he said. "We have adequate refined capacity, inventories are at an all time high. The issue is the price of crude." Committee Chairman Sen. Patrick Leahy, D-Vt., likely summed up the feeling of many senators on the panel. "The people we represent are hurting, while your companies are profiting," he said. "We need to get some balance." The hearing marked the second time in as many months that top oil industry officials have been called before Congress. In April, roughly the same lineup defended their firms before a House committee. The hearing was ostensibly called to ask the executives why they needed some $18 billion in federal subsidies in light of their record profits, but quickly became a Q&A on bigger questions in the energy business. Lawmakers criticized the firms for not investing enough in finding new oil and developing renewable resources and told them, in thinly disguised terms, that they'd be forced to enact extra profit taxes if Big Oil continued to post such large earnings. The oil men said they're making business decisions in the best interest of their shareholders. They repeated their often-stated position that the best way to lower prices and bring more oil to market is to open up wide swaths of the U.S. that are currently off-limits to drilling. Although lawmakers don't vote on energy issues strictly along party lines, Democrats generally want to increase taxes on Big Oil and use the money to fund renewable energy research. Republicans generally favor opening up the Alaska Wildlife Refuge, large parts of the Rocky Mountains, and areas off the east and west coast that have been closed to drilling since the 1970s following a public backlash after several big oil spills. The parties are widely apart on the issues - a Republican effort to expand drilling recently failed in the Senate - and a compromise is not expected soon. But both the Democrat and Republican proposals are long-term solutions that would have little impact on the nation's energy picture for several years, if not decades. In the short run, experts say there's little politicians can do to bring down the price of gas. Recent proposals to suspend the gas tax from the Democratic presidential contender Hillary Clinton and presumed Republican nominee John McCain were roundly criticized for leaving the government with a cash shortfall while possibly encouraging more driving, and by extension higher prices. A measure to stop filling that nation's Strategic Petroleum Reserve was enacted last week with wide bipartisan support, but has done nothing so far to stem surging crude prices. Are you feeling the pinch of gas prices? Tell us how gas prices are affecting you and what you're doing to cope. Send us your photos and videos, or email us to share your story.